When a homeowner, new or old, is trying to decide on what they want their garage door to look like a lot of questions come into play. Here are some topics you should look for when choosing a garage door. 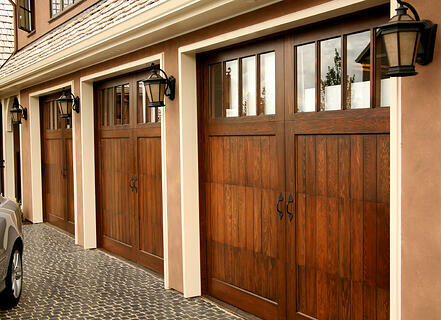 1) What Made You Want A New Garage Door? This topic is very broad as well. There could be many reasons why choosing a garage door is just the thing your house needs. You’re tired of the freezing cold temperatures, the garage door is always getting stuck, or you’re personally just tired of the plain look of your door. If these thoughts have crossed your mind, then you are on the track to choosing a new garage door. 2) Is The Appearance Of Your Garage Really Important To You? When you are choosing your garage door, appearance needs to be at the top of your list. Let’s say you are in the seller’s market and want to make a few updates on the house to get it sold. Studies show that the ROI on a $1000 investment is 84% after replacing your garage door. Choosing a door with an attractive design, or just the right color can make that investment one of the best choices you’ve ever made. Appearance is a broad topic when it comes to garage doors. There’s the design of the door, color, what doors are on the market, and even how many garage doors you should have. This brings us to our next topic. 3) What Types Of Doors Are Available? When it comes to shopping for a new garage door there are 3 categories: wood, metal, and fully-glazed aluminum. Now, how you choose to design it and put your own personal touch on it, is totally up to you! What type of home you have also factors into this decision. If you want the fully-glazed aluminum door, then those are used primarily on modern or contemporary-style homes. These are also a little bit more expensive due to the size of the large windows. Metal doors can be uninsulated or insulated and of varying thickness. The best feature about a metal door is that they require no maintenance, as they’re manufactured with fire-glazed paint. If cost is one of your main concerns, then the uninsulated door is the most economical. If insulation and weather-tightness are important to you, consider a 1¾” door insulated with polyurethane foam. A wood door is going to be your least expensive purchase, but will need the most maintenance. This type of door is more appealing due to its natural and traditional look, but requires more attention to protect it from the elements. Of course there are other materials such as, PVC doors and fiber glass doors, but have flaws to both of them. 4) How Should I Prioritize My Selection? There are tons of factors that fall into this selection but here are 3 categories to break it up for you. The Budget: Having this ahead of time can always help you while choosing a garage door. Most single doors cost less than $1000. How the garage door works: You will need to know the functionality of the door, strength, durability, security, insulation, and weather-tightness, ease of maintenance, product and installation guarantees. The door design: Does the door go with the style of your home? If you factor in these 3 topics while choosing a garage door, then your experience should go smoothly. 5) What Plans Do You Have? If you have everything planned out and your budget ready to go, then your last question you should ask yourself is, “what do I plan on using my garage for?” Would you be using it daily? Just to park your car? Is your garage insulated or not? Is it a renovation or a new construction? Will you be doing more activities in it? These are just a few questions you should cover during your process of choosing a garage door. At Overhead Door we want to make your experience as easy as possible. To get a free design consultation today click here. So you finally have your garage ready for the spring/summer, and all of the sudden your garage door opener is broken. The first thing that runs through your mind is, “How can I fix this myself?” As a homeowner you would rather try to assess the problem and figure it out yourself, than to call a repairman. Here are some steps to take in order to get the garage door help you need. First off, before we assume that it most definitely is the opener, you will want to check the garage door itself. Checking the alignment springs and easy opening are the steps you will need to take. If it is too difficult to open the garage manually, then it more than likely is not the opener. Now, you’ve done all these steps and everything has checked out, but the garage opener still will not open when you push it. You will then start the process of assessing the opener. First, you need to check the wall control. If the light is not on, then there is a tripped circuit breaker, and it needs to be reset. If that checks out, then try resetting the wall control. Unplug the control, wait a few seconds, then plug it back in. Sometimes resetting the opener is all the garage door help you need. I’ve Assessed The Problem. Now What? So you have done the checklist so far, and the opener is still not working… now what? Well, two of the most common repair problems on the openers are nylon gears and logic board malfunctions. Both of these problems are costly, and most homeowners would be better off just buying a new unit. That is not always the case though; some homeowners can check the warranty to see if parts and labor repair costs are covered by the warranty terms and conditions. If the unit is not covered under warranty, then you should contact your local Overhead Door to assist you with the problem over the phone or request an estimate online. 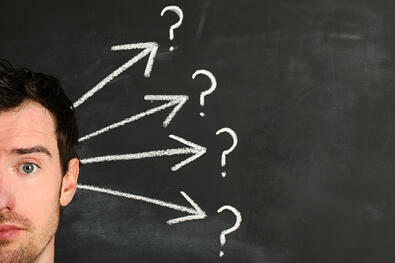 For more garage door help, questions, or concerns please visit our website! Spring is finally here and you've been in and out of your garage a little more than usual lately! You may have noticed your garage isn't quite as tidy as you remembered last spring…well, you aren't alone! 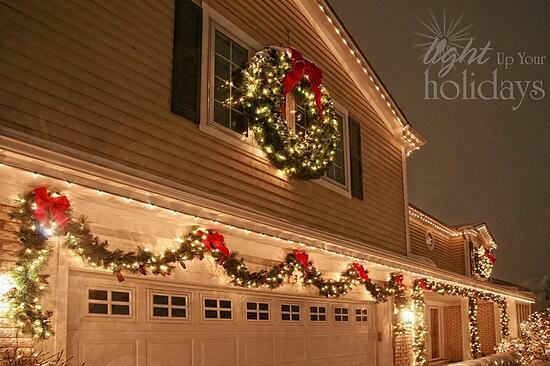 Most people wish their garages were a little more organized, especially this time of year. Get your garage spring/summer ready with these brilliant (and easy!) garage organization tips. Before you begin your garage organization project, make sure you set aside an appropriate amount of time. Depending on how big your space is, (or how big your project is), you may need just a Saturday. However, give yourself more time than you think is necessary. Designate a weekend solely for your garage organization project. Begin by sorting the items in your garage into three piles: keep, trash, sell, or donate. Mark areas of your garage/driveway with a piece of tarp or chalk. What to get rid of: broken items (trash), outgrown toys (sell/donate), expired chemicals (dispose properly-trash) or anything you haven't used in two years or more (sell//donate). If you have a hard time getting rid of things, take a picture for a keepsake! For items that must be in your garage (scooters/bikes, tools etc.) consider wall storage. By putting things on the wall, you free up floor space (and reduce tripping hazard). There is a wide variety of wall storage devices available at hardware or home improvement stores. You can hang everything from your bike to your tool set, all in an easy-to-see, organized space. Designate a bin for specific activities. For example, for baseball equipment, have a "baseball" bin. For craft supplies, designate a "craft" bin. This way, not only do things stay organized, but everything has a place. That means no more wasting time looking for something! Hopefully, those garage organization tips will help get your garage tidy and organized! 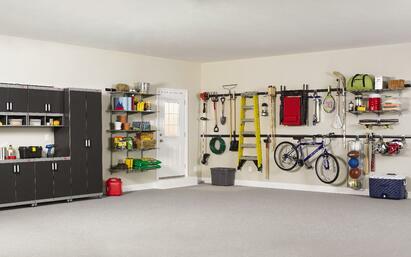 Not only is an organized garage safer, but less clutter is sure to improve your mood AND save time. Good luck and HAPPY SPRING! Garage doors, (like almost anything these days! ), are being constantly updated to provide a better product. That is why on March 9, 2015, we launched a V10 embossment for the Thermacore® Collection called Model 192 Series. This new product embossment has one of the widest product offerings in the industry! Find out more about the Thermacore® Collection Model 192 Series. The Thermacore® Collection provides premium insulation steel garage to help keep your garage comfortable in both cold and hot climates. The steel doors boast an R-value of 12.76 (meaning they are high in thermal efficiency). The available colors of the Thermacore® Collection are white, almond, desert tan, sandstone, brown, terra bronze, hunter green, gray, and black. Additionally, the doors can be custom painted to match your home. The Thermacore® Collection is also available in optional wood grain finishes, including golden oak or walnut. Our WindStorm™ wind load rated system is also available, meeting regulations for a variety of wind speeds, including hurricane-force winds. Our system usually meets the most stringent local building codes. The Thermacore® Collection has a variety of glass options, including clear double strength, tempered, obscure, clear acrylic, high velocity impact and solar bronze. As always, we provide you with the option to further individualize your garage door with decorative hardware. If you think the The Thermacore® Collection may be the right look for you, contact us for a FREE design consultation. One of our Overhead Door design experts will come out to give you an in-depth consultation to decide what would be best for your home! Request one here.